I’m still trying out a few products from LUSH’s new Emotional Brilliance cosmetics line, and this item has turned out to be one of my favorites. 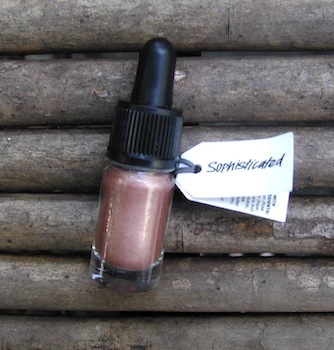 It’s a cream eyeshadow in the shade called Sophisticated, and it was one of my selections in my Emotional Brilliance preview reading (which you can read about here). Emotional Brilliance offers six shades of cream eyeshadow in neutrals and pastel shades, plus one wild-card green. 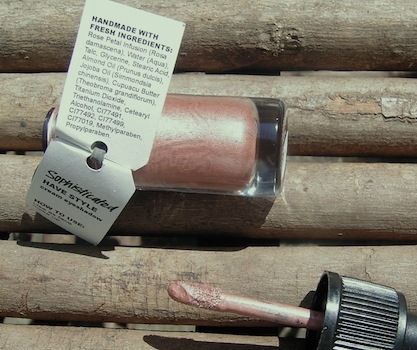 Similar to the line’s Liquid Lips (which I’ve already reviewed here), the shadows are formulated with a gentle base of almond oil, jojoba oil, and rose petal infusion and they are not tested on animals. 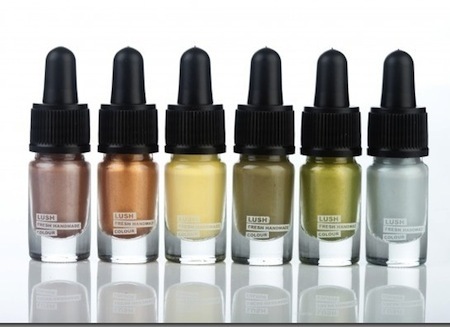 Just like the lip colors, the eyeshadows are packaged in small glass bottles with screw-top caps and “doe-foot” applicator wands. Sophisticated is a neutral shade; I’d call it a shimmery taupe. It looks a little bit warmer in sunlight than it does in indirect lighting (as you can tell from the difference between my two photos! ), but overall, I’d say it skews cooler. Its shimmer (from titanium dioxide) is very fine, so that you won’t have any sparkly or glittery effect when you wear it. 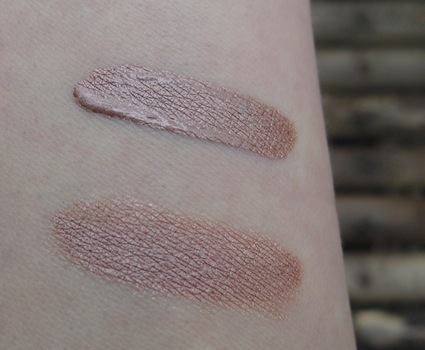 Here are two swatches of Sophisticated on my wrist, one freshly applied and one very lightly blended. The cream looks much less metallic on skin than it does in the tube, which makes it appropriate for daywear and the workplace. I’ve been applying Sophisticated to my eyelids with the tip of my pinky finger and blending it with my fingertip as well. It dries within a minute, so you can’t take too long, but the results last all day when I wear this shadow over an eye makeup primer (like Urban Decay’s Primer Potion). It does crease a bit without primer. Then, of course, there’s the name, which is a can’t-miss part of the product’s appeal for me. It reminds me of the classic jazz composition “Sophisticated Lady” by Duke Ellington and Irving Mills. All in all, a hit for me. LUSH Emotional Brilliance Cream Eyeshadow ($22.95) is sold in LUSH shops and on the LUSH website. Disclaimer: this product was provided as a press sample for consideration/review. 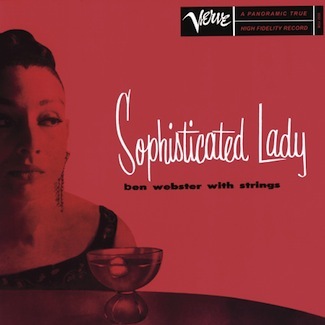 Images: Cream Eyeshadow photo line-up via LUSH; other product photos by Tinsel Creation; cover of “Sophisticated Lady: Ben Webster with Strings” (1954) via Discogs.